“This is a very nice concours,” Tom Roos told me as we looked over the collection arranged on the manicured fairway. “Especially for its first time,” he added. I agreed, as I am a fan of concours. 118 cars were present to commemorate the 118th year of the Pinehurst Resort (Pinehurst is golfing Heaven for those who golf). Cars in 11 classes competed for honors, with Porsches entered in the Preservation group, as well as a class for Porsches alone. 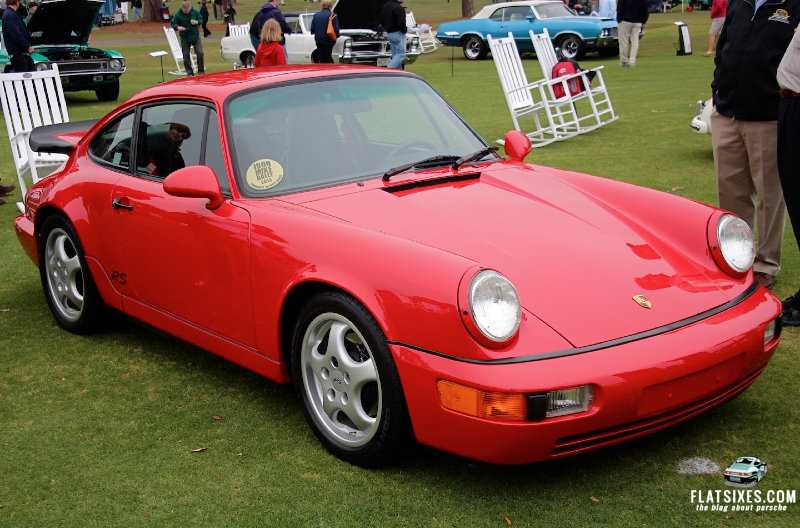 In addition to these two groups, there was a sampling of historically significant Porsches from the Bob Ingram collection (Bob served as Honorary Chair of this first Pinehurst Concours). For the entrants, Friday featured a 35-mile rally that began at Pinehurst. Participants were feted with a full military banquet on the lawn at Ft. Bragg military base hosted by camouflaged soldiers, with the National Anthem sung by Miss North Carolina, and entertainment, Army-style. No armaments were fired, however, due to current Sequester budget cuts! Saturday presented a challenge, as Porsche owners faced off in a putting match. This is, after all, a golf resort. Needless to say, the Porsche owners won! Sunday’s event was memorable for the quality of the entrants in all classes, including a brace of cars from the Holman-Moody collection. Significant and unique cars, such as a 1938 Steyr Roadster and a 1937 Bugatti Type 57 were among the group. Class winners were escorted to the podium by caddies uniformed in traditional white jumpsuits. Despite unseasonably cold weather, the thousands of onlookers, as well as the entrants, witnessed a great event on a lawn that was to die for! How Far Would You Drive to Get to a Porsche Event?